Patricia Luna and Carla Pérez from 2nd BCS have been to Holland with the teacher Jose Luis Pueyo for a few days. They have participated in a concert for the conmemoration of the 1st World War with other European students. They enjoyed a lot. According to many people, the wheel is one of the best inventions in history, though it isn’t my favourite. I agree that if the wheel hadn’t been invented, we couldn’t have had any machines, any means of transport, etc… Practically everything around us works with wheels, or have been manufactured with machines working with wheels. At this moment, without it, the world would seem not like a modern world. However, there are also negative things, as because of the wheels there are lots of accidents every day. To sum up, there have lots of good inventions along history which have helped to our progress in order to get a good quality of life. A GROUP OF TEACHERS HAVE BEEN TO DUBLIN - IRELAND FROM 10TH TO 13TH. Try this link if you want to improve your level of English. There are thousands of tests with solutions for you to revise basic concepts. 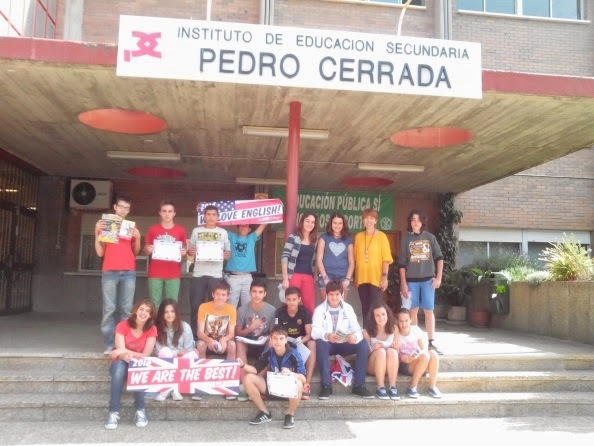 last year, we participated in the European competition test and this is the photo when we got the rewards. If the world is round and it is called ‘palaneta, why isn’t it called ‘redondeta’? Why is it that when people are driving and can’t see, they put the radio off? If a lawyer goes mad, can he lose his judgement? Why do we open our legs when we get to the top of the mountain in order to breathe? Why do we open our mouth when we look at the ceiling? What do sheep count in order to get asleep? 7Why black plums are red when they are green? Where is the other part of the Middle East? Where has it gone? Why do we shrug our shoulders when it rains? Why do we have to go to the beginning when we get to the end on the computer?